Understanding epiphytic plants are plants that ride on other plants as a life, live attached epiphytic plants in other plants without "steal" nutrients from their host plants. However, epiphytes can be a competitor to the availability of light. The roots of epiphytic sometimes penetrate the tree cover and carrying so damaging physiological balance of their host plants. Examples are epiphytic plants orchids and ferns. Its name is formed from the Greek epi = surface or cover and phyton = plant or tree. Unlike parasites, epiphytes can be entirely self-sufficient, off the ground as a buffer and a provider of nutrients for life, as well as from other plant nutrients supplied. The water obtained from rain, dew, or moisture. Mineral nutrients derived from dust or decomposition stems and remains of other plants decompose. Although not "steal" nutrients from the host plant, epiphytes can be a competitor to the availability of light. The roots of epiphytic sometimes penetrate the tree cover and carrying so damaging physiological balance of their host plants. 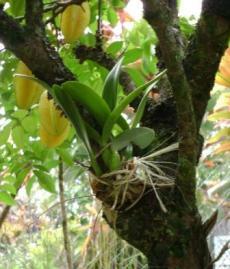 Examples of epiphytic plants is a popular variety of orchids, pineapples nanasan (bromeliad), and ferns.